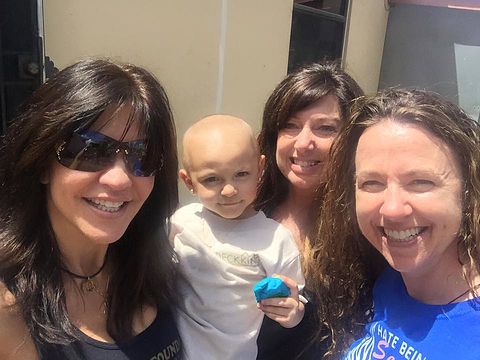 Travelink's very own Vacation Travel Advisor, Bev Gallant, is helping celebrity landscaper, Ahmed Hassan, build a germ-free playground for a 2 year old cancer patient. Daniella Collazo has been battling neuroblastoma stage III cancer, a type of cancer that develops in the nerve tissue with a high relapse rate, for almost a year. For the past 10 months, she went through six chemotherapy cycles, multiple blood and platelet transfusions, a bone marrow transplant and many hospitalizations. Once Daniella was released from the hospital, she soon realized everywhere was a dangerous environment due to her weak immune system – including her neighborhood playground. As a result, the Mystic Force Foundation, which raises money for childhood cancer research to find safer and less toxic therapies specific for children, reached out to celebrity landscaper Ahmed Hassan and asked him to help build Daniella a germ-free playground. After Ahmed said yes, he quickly contacted Bev Gallant to help coordinate all of the travel logistics involved with doing a two-day landscaping make-over in Miami. Bev commented, "This has been the most inspiring project I've EVER been a part of. It's so wonderful to see everyone collaborate from all over the USA to help spread childhood cancer awareness and help Team Daniella. In my 23+ years as a Travel Advisor, I've been involved in many projects but this one has touched my heart and so many others." To find our more about how you can help, please visit Daniella's website.